Himalaya Herbal is a well know brand here in Malaysia. Most of us knew this brand right. Known as a natural ingredients product that suit natural lover products. Last few weeks I have been invited for a lil session for their newly launch product. Its a whitening range that includes all the simple basic steps in skincare. These are the new range from Himalaya Herbals! 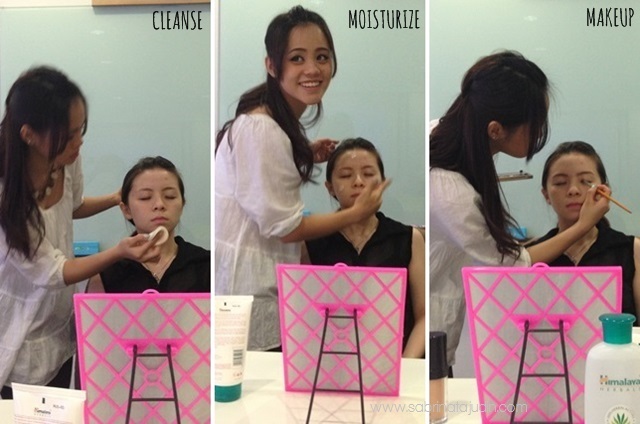 During the mini small gathering event, they show us on how is a proper skincare routine and makeup is applied. As usual, cleanse, moisturize and makeup! We talk alot and discuss about it and learn so may things. For example, We need to apply our makeup, downwards as possible to prevent clogged pores. Thats is another group in the vent, and congratulation to them because they won the massage technique arrange game! hehe..
Below are the correct steps that we need to practice when applying or moisturizer during skincare application! Goodies! (But I dint get the toner! :(. They must have been forgot to put in my goodies bag) And thank you for being so nice! Since the vent was held during the fasting day, they packed us a cute pink cupcake! Delicious! Will review soon the skincare rage in future post! do stay visit!